Once you get past the trainwreck that the first Hunger Games movie was, you’re in for a treat. Catching Fire brought the Suzanne Collins story to life. Follow that up with the thrilling Mockingjay Part 1, you have to be unsure if they can continue the trend of improving upon The Hunger Games. Fret no more, we discovered the truth when Lions Gate Entertainment released The Hunger Games: Mockingjay Part 2 this past weekend. They did it, they really did. The Hunger Games: Mockingjay Part 2 was a perfect follow-up and close to the previous films in this series. Not only did it bring the story to an end, it continued with the action and suspense the books intended there to be. Healing takes time: In The Hunger Games: Mockingjay Part 1, we saw Peeta Mellerk attacking Katniss. His attack left bruises and scars on her neck. It even hindered her ability to speak.We see the lasting impacting of Katniss’ injuries in the beginning of the movie as her mother removes the bandages on her neck. We see bruising and we hear Katniss struggle to speak.Her wounds weren’t fully healed. It was taking time.Be forewarned: You WILL be hurt during your time as a leader. Someone or something will offend you. Don’t expect the healing of this wound to come instantly. Like a physical wound, healing takes time. Be confident in what you can do: The Resistance was getting ready to strike back against the Capital. Katniss knew this and wanted to be a part of the offensive.She was blocked by her superiors but pushed back. She stated her case and told them exactly what she could do.Katniss knew her abilities. She knew she could move people. And she wanted to be a part of it.Do you know what you do well? If not, you need to gain clarity in this area. When we’re clear on what we can do, we can step confidently into the role we’ve been given. The choices in front of you may not be pretty: In war, there are always casualties. Sometimes it’s the innocent.As they prepare to engage in battle, they begin to realize their choices aren’t pretty.There will be casualties among the innocent. People will be hurt.Whatever action they take, there will be negative consequences. You’ll have to make choices where there’s no good choice. It will be a decision of what is the lesser evil. It’s a hard position to be in. But it’s one that a leader is required to make. Bad leaders turn people against each other: In the previous Hunger Games movies, we saw how President Snow and the previous leaders of the nations pitted one nation against another in vicious battle.This led to animosity amongst the nations.We then see President Coin begin to do the same thing. She believes others must pay and that requires people to fight against each other.Rather than trying to reconcile the nations, these bad leaders tore them apart even more. Your job as a leader is to get things done. Yet there’s more to the role of a leader. You can also help people come together. Bring peace where there’s conflict. Do your best to spread unity. It will pay dividends in the future. It doesn’t matter what you want. It’s for Peeta. We lose sight of what our goal is. Haymitch told those opposed to helping Peeta that it didn’t matter what they wanted. It wasn’t about them. It was about helping someone else. This rings true with the leadership lessons taught in Simon Sinek’s book Leaders Eat Last. As leaders, you will have to put aside your personal desires. It’s no longer about YOU. It’s about THEM. Not everything you see is real: The rebels were constantly filming new propaganda films to gain the sympathy of those siding with the Capital. While it was a worthy cause, we know that what happens in the films were not always the truth.Peeta’s gun was empty, action scenes were shot after the battle happened, multiple takes were shot. Not everything was real.You will have to discern for yourself what is real and what isn’t. People will put on fronts to gain your graces or to rub you the wrong way.Be wise and seek the truth. I’m a huge proponent of celebrating our wins. Doing so reinforces that what you’re doing is worthwhile. However, there are times to celebrate and times to continue trudging forward. We have to know the difference. Know yourself: Peeta was brainwashed in the previous Hunger Games movie. He lashed out at those who cared about him and thought they were against him.He didn’t have control of himself. And he begins to realize this as the movie progresses.We see a drastic change in his attitude as he sees his old friends as friends. This doesn’t stop the brainwashing from coming back and he knows it.He asks to be put down, he asks for a pill to take if he feels he’s getting out of control. He knows he’s dangerous. Do you know yourself well enough to know when you’re a danger to others? It’s something we need to be aware of. When you know this, you have to figure a way out. Nothing quite as drastic as Peeta’s desire but you should be willing to move on or out of your position if you’re a danger to others. 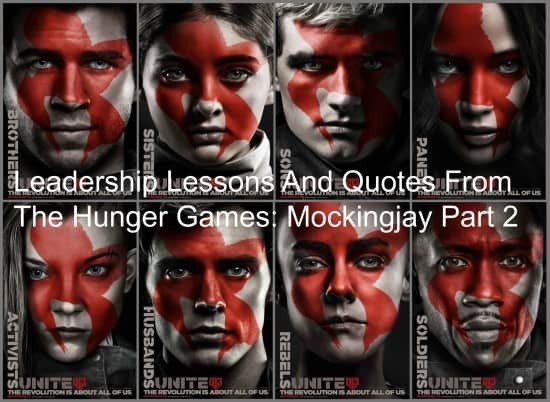 Leaders can be plucked from the masses: Katniss wasn’t always a hero. She was just a girl in a poor area.Then she made a choice to stand up for something: Her sister. This plucked her from the masses and made her a symbol of hope and love.Do you ever feel you’re lost in a sea of multitudes? We all do at some point or another.The good news is that you can stand out from the crowd. You can be the one to make a difference. Be open to other possibilities: As Katniss’ rebel group was trying to infiltrate the Capital, they ran into multiple booby traps. Members died and they had to continue moving on towards their goal.Eventually, it became too dangerous and they had to be open to new possibilities. One of those was going underground and avoiding the city streets.This was a wise move. 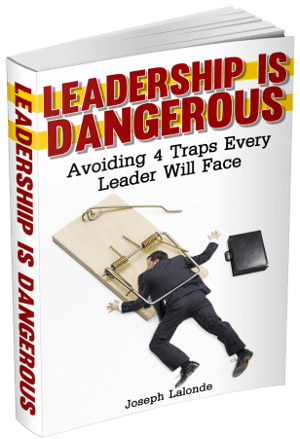 They were able to bypass most of the traps set for them.You won’t have to face many traps in leadership. You will, however, have to navigate touchy situations where there seems to only be one choice. In all likelihood, there are more choices for you than you see in front of you. Look for a different way to execute your plan or to move the organization. You can find new ways to do things. Because of Katniss’ choices, people were hurt. People even died! Her choices impacted the lives of those she led. While she didn’t intend for the things that happened to happen, they did. That’s a part of leadership. Our choices have far-reaching impact. We have to live with the decisions we make. The safe option may change: The rebel group made a wise choice in moving to the sewers. They were able to make great progress towards reaching President Snow’s house.Then things changed. The Capital realized what was happening and set traps for the group in the sewer.Their safe option became extremely dangerous.You may encounter this. You make what seems like a safe play in the organization and then things go downhill. Be ready to move from the safe option to the dangerous choice. We can all be played for fools: Katniss fought for President Coin because of the story Coin sold her. She made it seem like she cared about the people and making things right.Well, she didn’t want that. She wanted power.To do that, she played those that could get her what she wanted.Be wary of those who are trying to sell you something. There may be more behind it than you expect.